I just got home from a long day of frustrated protesting. There was so much activity today and action, but the momentum wasn’t retained. The conclusion is bittersweet in that so many people seem committed to change, but so little came of it. Here is my best to give a recap of the events of today. 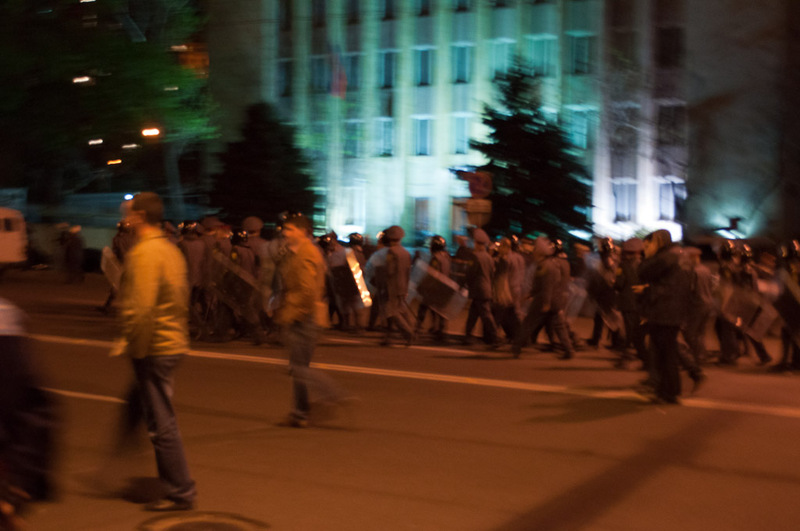 10:30am: A march of people from Yerevan’s regions gets hassled by the police. 10:45am: The student protest begins with students marching to Freedom Square. 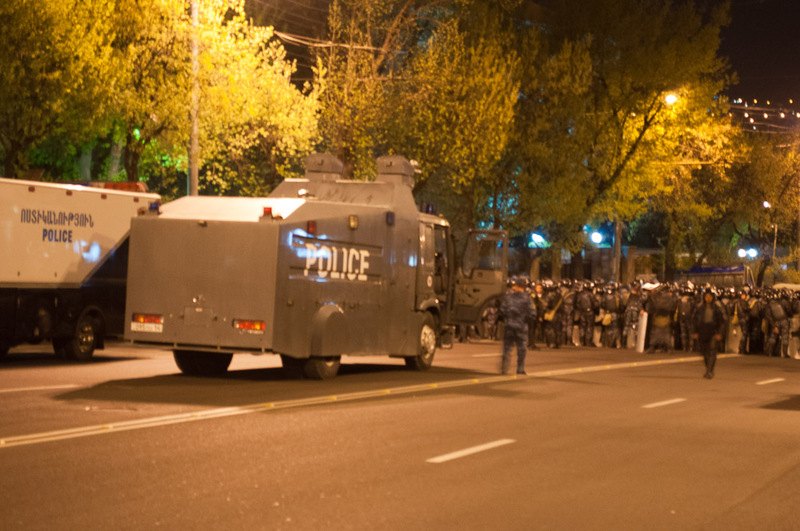 When the protesters arrived at the Yerevan State University Black Building, the guards locked the door, trapping the students (and me) inside. The rationale being that they need to protect the good students inside from the protesters. 11am: Raffi’s rally officially begins. This is Armenia, so it doesn’t really start until noon. 12pm: Raffi gives his speech. It was a speech similar to other speeches saying that he’s here for the people and that the people of Armenia are the ones with power. Also, Serzh Sargsyan should come and apologize to the people. The square is filled with people at this point. Rumor has it that Reuters estimates 12,000 people present. 1pm: At around one, Raffi gives his oath. It wasn’t the oath of presidency, but a “citizen’s oath.” Hetq has the details. Afterwards, he said there will be song and dance and to reconvene at 6pm. This is where I, thinking it was over, leave to go back to work, disappointed with the lack of content of his speech and how it sounded similar to all of his other speeches. 2-3ish: Raffi stayed in the square and people started complaining that he needs to do something. So, while half of the crowd has already left, Raffi starts leading a march in the city. He heads towards Haraparak and Tigran Metz, but suddenly switches directions and goes up Mashtots towards Baghramyan. This is where things get iffy because the police aren’t happy with the changed marching path. Some people are arrested. 3ish: At some point, Sargsyan has his inauguration where he says he will focus on emigration, unemployment and poverty (videos). 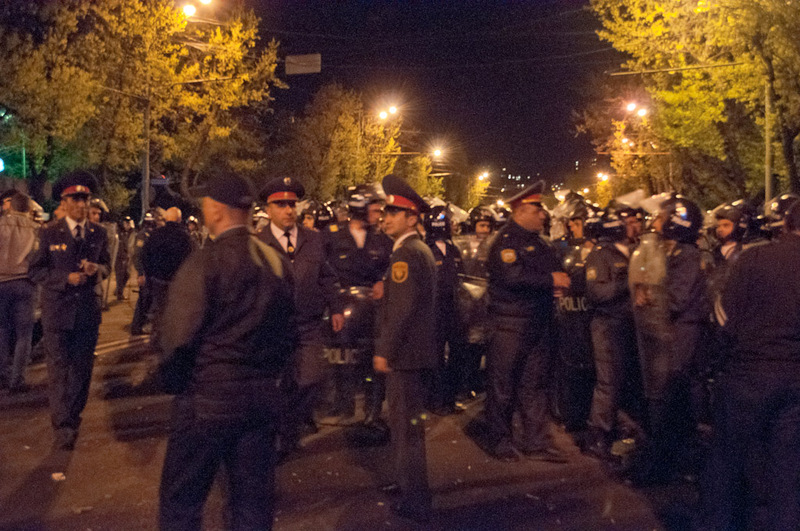 4pm: The police hold back the people on Demirchyan. 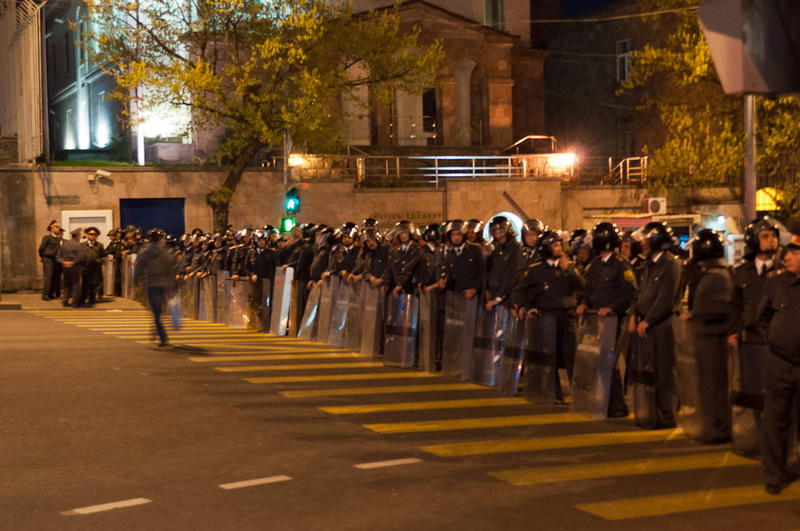 Rumor has it, that it was done to give time for police to setup barricades on Baghramyan. They fall back within an hour. 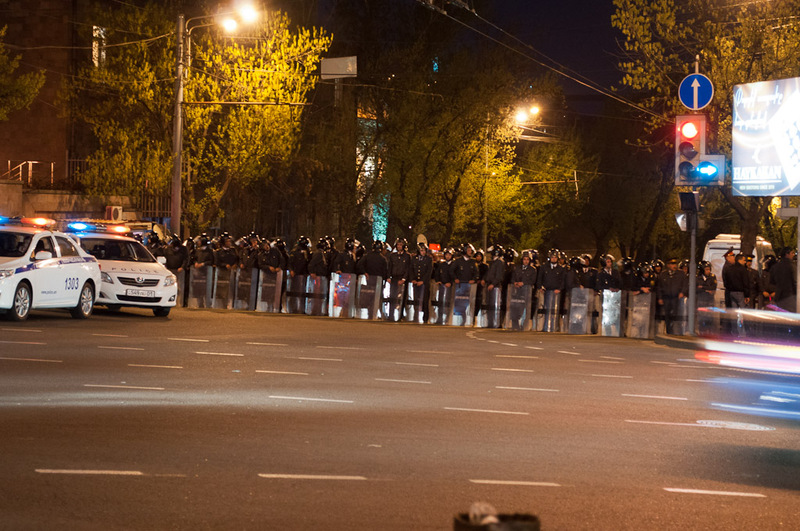 5:30pm: A splinter group of protesters does a sit-in in front of the Presidential Palace and gets arrested. 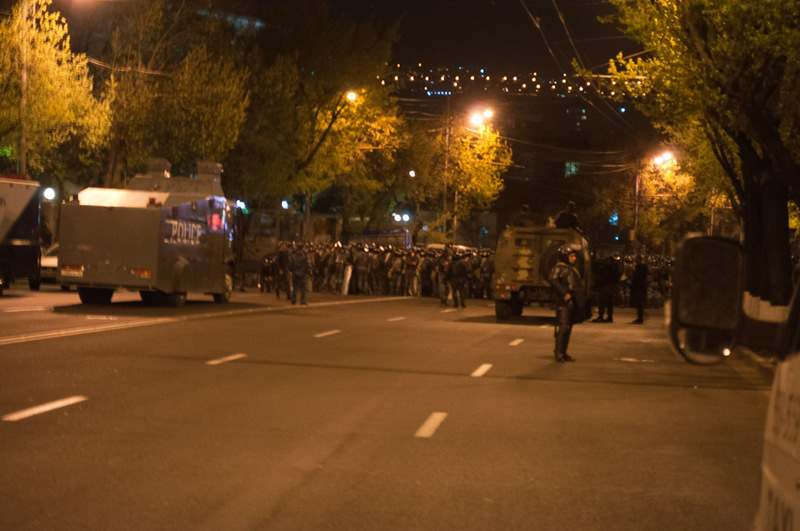 This news report says it happened at six, more notably, Zaruhi Postanjyan asked the protesters to go back to Freedom Square but they refused. [Added:] 6pm: The crowd reconvened at Freedom Square where Raffi told the crowd that he would reveal his plan on Friday, the 12th. The crowd was angry and “booed and screamed” at Raffi to get him to do something. They convinced him to march to Baghramyan. 8pm: Marshall Baghramyan metro stop was closed all day, so I walk to the protest coming from the North West. I’m able to get into the closed off center of the street and take some awesome photos (see below). I join the crowd at Baghramyan and Isahakyan. 8-10pm: Absolutely nothing happens as the people mill about. The crowd is constantly dwindling, decreasing from a few thousand to a few hundred by the end. Frustration with Raffi’s back and forth is increasing. Many people are saying that he, as a leader, failed the people. Finally at about 10:30pm, the police allow the people to walk up the sidewalk of Baghramyan and open the street to car traffic. Almost certainly this came about from Raffi’s negotiation, but I can’t confirm. The plan was to sing the national anthem at the Presidential Palace, but no one felt like singing at that point. Overall, many of the people I talked to are excited for the amount of energy and activism shown by Armenian people, while being frustrated with Raffi. Raffi did not have a plan for today, let alone a plan for the near future. While the people showed a lot of energy, that energy was lost by people waiting to see what Raffi would do and by his inconsistent comings and goings. [Added at noon on 10 April:] ArmeniaNow has a good write up on the day. Also, my friend Ani has a (long) first-hand account of the day’s events from her perspective near Raffi’s family. She also has maps of the marching paths, in case my description above is confusing. 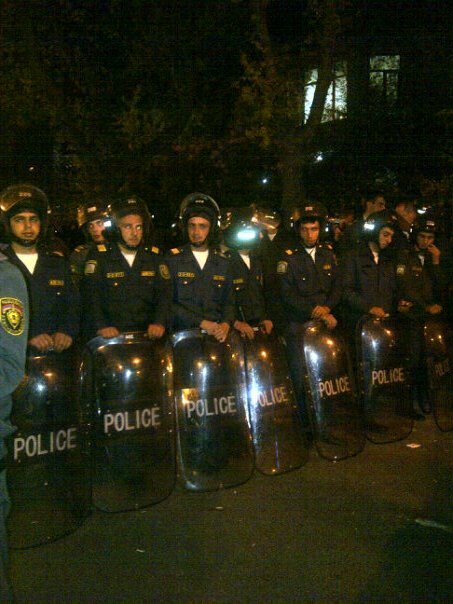 The wall of cops at Baghramyan and Proshyan, stopping anyone from coming down Baghramyan. 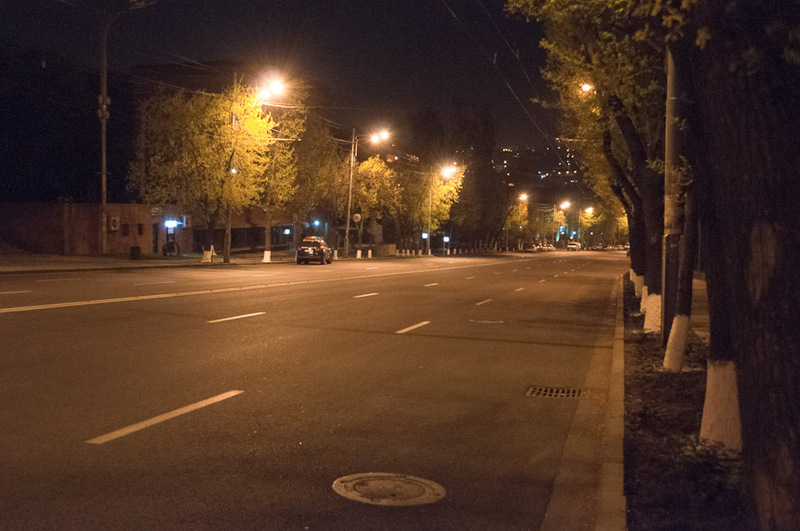 The empty street of Baghramyan, between the lines of cops. A secondary line, in case the protesters get passed the first line. The main protest line. The police and the protesters were milling about here for hours. After sitting around for a while without anything going on, the police put down their shields and relax a little. The final walk up Baghramyan, and the police that followed the people up. Բացառիկ դիտաւորում. շատ լաւ պատկերացուցիր, քանի որ տեսերիԶները դիտելով մենք չկարողացանք իմանալ ինչ կը պատահէր..
Good write-up, but your timeline is a bit off. If you want clarification, let me know. Hi Chris, thanks for the reply. I knew my timeline was spotty (thus all the “ish”s) as I was trying to use contemporaneous twitter tweets to time the events, but there was so much confusion it was impossible to pin down each event’s time. I’m happy for any corrections you can give me. So are the people who didn’t follow the people to the genocide monument with the people or not? Or will these people have to answer to the people like Raffi always decrees? Democratic development a la barevolution. Everyone is part of the people, even those that support the authorities and are against Raffi. Whenever anyone says “the people think X,” it’s impossible to be completely accurate as there are always opposing views. I apologize if I used that shorthand in my post. The issue here is that some people were willing to engage in civil disobedience while Raffi was not. Civil disobedience in protests is common, but so is the desire to not get your followers arrested. As an outsider, I can’t comment on whether civil disobedience ought to be done, but I can say that this one point showed a major rift between Raffi and his more committed activist supporters. I think there are two things happening. Raffi insists on peaceful demonstrations of protest, which haven’t gone anywhere since he simply doesn’t have the numbers to bring about a Saakashvili-like revolution. Clearly not enough people are coming out in support, likely because they think nothing will ever change whether they demonstrate or not. Then there is a sizable number of followers who want confrontation, who want civil disobedience and even violence, which they got a dose of last night. Raffi needs to understand that things won’t change by holding rallies once a week, and citizens have to understand that society won’t transform by bashing in heads, either. So there is a clear impasse as to the strategy for going forward. I just returned from Liberty Square and there is zero happening–no one from the Barevolution movement, and no one from the student wing. It’s as if nothing transpired last night. The momentum had to continue. But is that Raffi’s fault or the people’s? I think that’s a very apt analysis Christian. There has been a dearth of creativity in the protest actions (as you say, weekly rallies accomplishes nothing). I wanted Raffi to use yesterday as an opportunity to promote the Barev Foundation and solidifying popular support through concrete actionable steps (“You want to do something? Great! come knock on doors for us for the Yerevan election.”). Having people sign statements of support a few weeks ago was a good first step. A friend disagreed with me and wanted Raffi to say what he would do as president. He could have given ideas in simple understandable terms that could then form a platform for the opposition parties in Parliament, Yerevan’s city council, or even CSOs. Either approach would have Raffi giving the people a path forward. Without doing that, the more rebellious faction will break itself away from Raffi’s coalition and the least committed people will stay at home. Raffi will supposedly be giving his plan on Friday. We’ll see if anything changes. THERE WILL BE NO REVOLUTION PEACEFULLY ! Never in history of man kind that has happen so people of Yerevan and Armenia stand up and break the barriers, you all leaved your life by ruling of corrupt government and bunch of greedy thief’s this is the time to sacrifice to gain your freedom !!!! Why are so many (greedy, sadistic) people ready to exhort others to sacrifice themselves for these greedy selfish pigs? Thankfully a grand majority of Armenians have street-smarts. definition: They are too smart to waste time hanging out in leaderless, purposeless mobs on the streets.